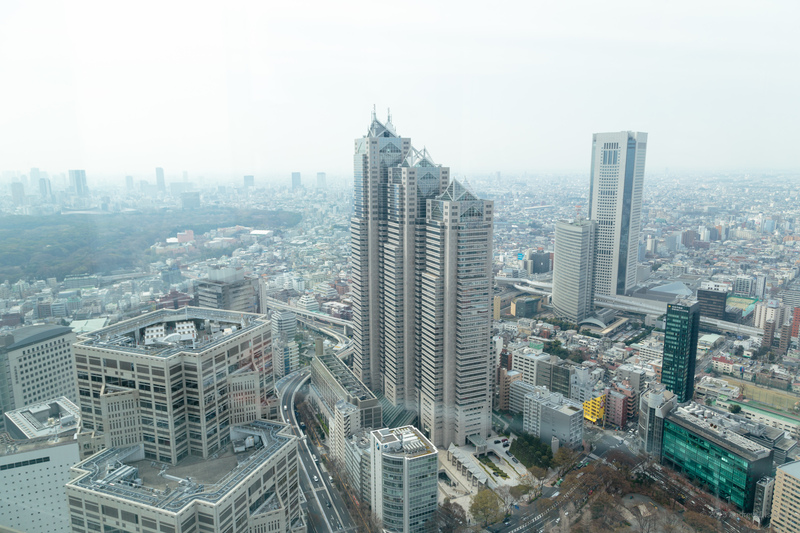 Nerdtour 2016 Japan: First full (frustrating) day in Tokyo… – Nerdwatch! So, today opened bright and early for me (well, early anyway) as I woke up at about 5 AM again, so after fitfully trying to get back to sleep I gave up and got up. I hadn’t planned anything specific, but as I was checking web cams around the area of Mt. Fuji, I saw that there were crystal clear views of the mountain, so I decided to try to take a highway bus out to a town called Oshino. I made it to the bus terminal in Shinjuku, and found out that you need to book ahead, as all the morning buses were booked for the next few days. The afternoon buses ran after 2 PM, which since it takes 2 hours to get to Oshino, I abandoned that plan since I couldn’t get back until the next day. 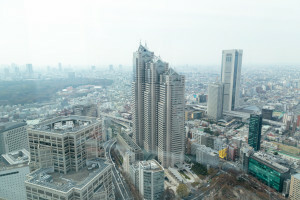 I decided to try for Plan B, go to a high spot in Tokyo and look for Fuji from whatever observation deck I could find. 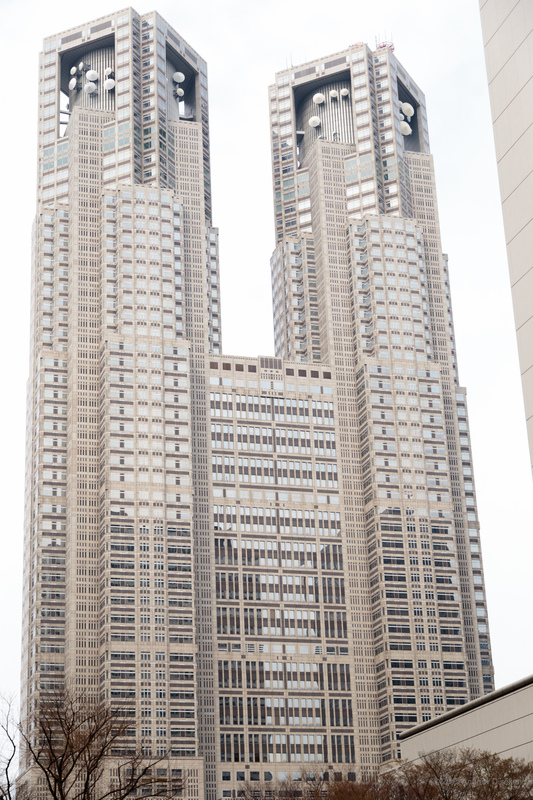 I discovered I was within walking distance of the Tokyo Metropolitan Building, which has observation decks on the 45th floor of each tower, so I thought this was my chance. Wrong. Turns out it was clear air near Mount Fuji, but in Tokyo there was major humidity which caused major haze, thick enough to hide Mt. Fuji and most of Tokyo. My luck continues on the Fuji viewing front. On a positive note, there was an exhibition on the observation floor, where each of the prefectures in Japan were displaying and selling products specific to those prefectures. I looked each display over, and decided to buy something from Iwate, Miyagi and Fukushima prefectures, since they were hardest-hit by the earthquake and tsunami five years ago. Yes, I bought food from Fukushima prefecture, and no I don’t expect to glow in the dark as a result. After a light snack of an apple strudel-like thing at the observation deck cafe, I set out to go back to the hotel to drop off my purchases. 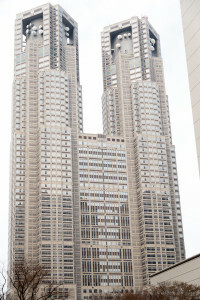 On my way out, I stopped at the Tourist Information Office on the first floor, and picked up some tourist brochures. 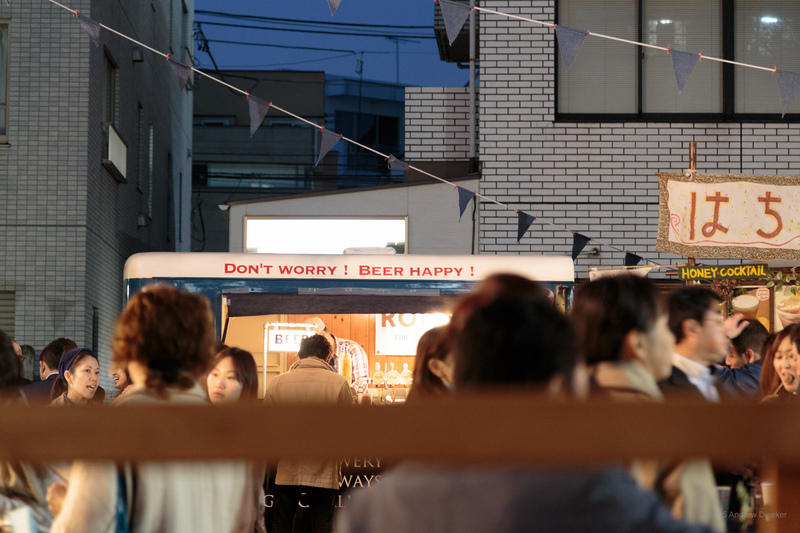 Sadly, I don’t think Tokyo’s going to be ready to handle a bunch of foreigners when they come for the Olympics in 5 years, since probably about 95% of the “tourist information” brochures were in Japanese only. Not a very welcoming sign. When I got to the hotel, the cleaning crew was still working on my room, so I went back out to the 7-Eleven across the street, bought a small salad with tuna, a sliced hard-boiled egg, lettuce, carrots, and corn, and ate lunch at a small city park near the hotel. 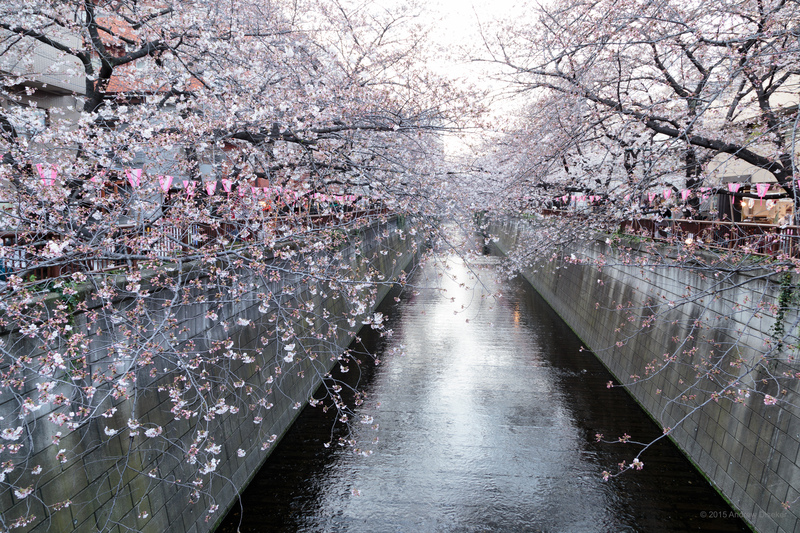 I finished a bit after the cleaning crew, so I was able to drop my stuff off, and drop myself in front of the laptop to scope out some cherry blossom sites. 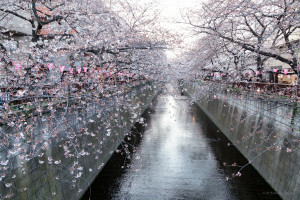 I had read about the Meguro river, which is lined with cherry trees on both sides, and which has a loooong street festival with food vendors of nearly every kind. The trees are lit at night and there are lanterns ever couple of feet, so folks can enjoy the view until late. So, since the Naka-Meguro station is at the end of the subway line that runs by the hotel, I figured I’d try it and see, at least I wouldn’t have to worry about being able to see it all. 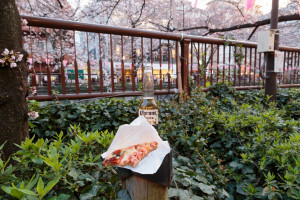 I got there just before sunset, and as I was wandering around I was amused by one of the vendors who was selling a square slice of pizza, and so I had to buy a small pizza and beer from them. 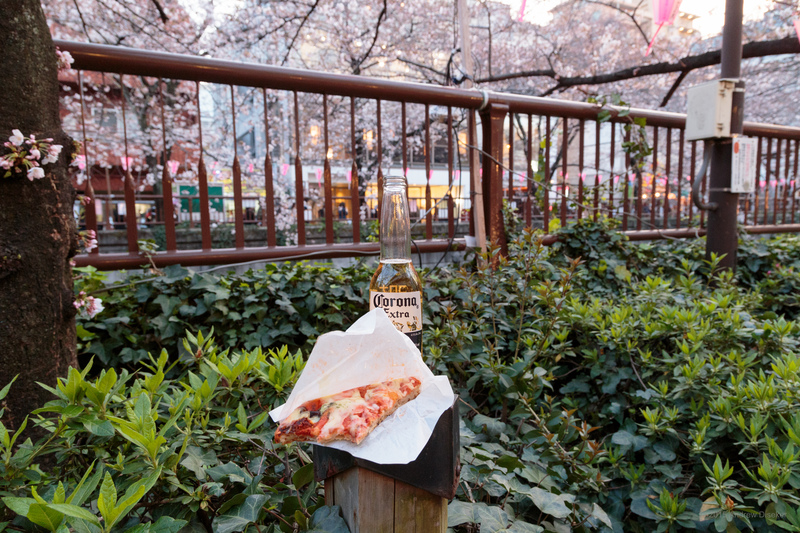 Corona beer, and Japanese pizza, while looking at cherry blossoms, the life of a modern world traveler! At any rate, here are some pictures from this day. Enjoy! Tagged Japan, Meguro, Tokyo, Tsukiji. Bookmark the permalink. Can you plan ahead another day to get to Mt. Fuji?